Yesterday we needed to pick up some old red bricks from my SIL’s house, so being Saturday (or Saturdee as my Grandparents would have said) my husband was nice enough to stop at some garage sales along the way there. I probably visited about five or six houses, but as it was after 9:00am pretty much all the serious garage salers had come and gone and taken their loot with them. You never know though, at times things are missed. 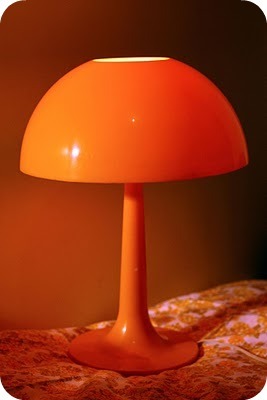 One particular sale, the first thing I spotted was an orange retro mushroom shaped, 70’s Paton style lamp (pictured). Getting a bit excited I approached it hoping that it hadn’t been set aside for someone else. Seems it was still for sale so I asked the owner to put it aside for me. A minute later I saw it in another buyer's hands! ‘Um, excuse me, I have already bought that’ (not entirely true but I had already told her I would take it). I then saw the same man pick up a vintage set of Persinware red scales with the original bowl for the top. Oh no! How did I miss that one? They would have been a keeper for sure and I had looked in the box he had found them in! Oh well, them’s the breaks. He offered to swap it for the lamp. Hmm, I love old scales but this lamp is just such a find so I politely declined. At the same sale I picked up the two sets of salad servers. The green ones are Australian made ‘Bexyl’ brand, made with ‘British Xylonite’. I am finding it difficult to get a date on these (perhaps Art Deco). The burnt orange ones I am thinking 60’s but will need to do some more research on them also. Funky! When I got back to the car my husband told me that they had a lamp exactly the same when he was a kid. It was his sister’s night light and it used to be bombarded by pillows if it was left on too long.